$2,249 Seen a lower price? $2,349 Seen a lower price? First introduced in 1976, the StingRay has become one of the most iconic bass guitars in history. 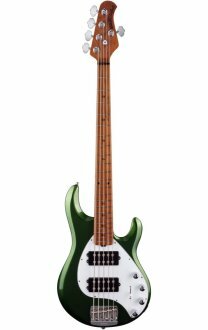 For 2018, the Ernie Ball Music Man StingRay Special 5HH 5-StringElectric Bass with Maple Fingerboard has been reimagined with features and appointments that provide a high level of playing comfort while retaining that revered iconic StingRay 5 sound. Featured revisions include an enhanced contour that is rounded for more comfort in any playing position, a sculpted neck joint for uninhibited upper fret access to all 22 stainless steel frets, and lightweight aluminum hardware providing a lighter more balanced instrument. The improved StingRay electronics feature more powerful neodymium magnets for increased output and a 18-volt preamp for extra clean headroom without clipping. Solid roadworthy construction, elegant pickguard, 4+1 tuning key configuration, and the ever popular Music Man humbucking pickup, all of which combined produce a look, feel and sound that is remarkably unmistakable. Same Day Music is an authorized dealer of Ernie Ball Music Man products. Available until 11 PM (EST) today. Mention special code 204-JFW7 when you call.